Getting humanitarian supplies into conflict zones like Syria is no mean feat, often requiring negotiations with warring parties, braving insecurity and facing repeated delays and logistical challenges. But aid workers can make it happen. In one of the latest examples, 54 tons of much-needed medical supplies arrived in Syria last month, destined for people living close to the frontlines of the conflict in the biggest city Aleppo. “More than 60 percent of the hospitals [in Aleppo] are out of service. Many are at the frontline and used by armed personnel,” said Fares Kady, medical coordinator for the Syrian Arab Red Crescent (SARC) and the focal point for the World Health Organization (WHO) in Aleppo. IRIN tracked the shipment, from the first phone call from a WHO official in Switzerland, all the way to the doctors in battle-scarred Syria on 13 April. Olexander Babanin is a supply officer with the WHO Crises Support team in Geneva. In October last year he made a call to a medical supplies company in The Netherlands to order medical kits to restock the standby supplies at the UN Humanitarian Response Depot in Dubai. “When the logistic supply chain starts, it is often not known where the medical assistance will in the end exactly go,” Babanin told IRIN. The international humanitarian logistical network means emergency stocks can be pre-positioned in key parts of the world for rapid mobilization. Medical kits like the ones that ended up in Aleppo are standardized packages of drugs and medical equipment, designed to be useful in a variety of regions and situations. The Interagency Emergency Health Kit (IEHK) is composed of some 90 different types of drugs and 90 medical consumables and equipment packed in 44 boxes. A single medical kit weighs just over a ton and its content meets the needs of 10,000 persons for three months. WHO is the coordinating authority for international health within the UN system, and every five years an inter-agency committee consisting of pharmacists and technical staff from different relief organizations decides what essential drugs and medical supplies will be included in the medical kit. The aim is to meet priority health care needs of a displaced population without medical facilities or a population with disrupted medical facilities. At the end of 2012 in the town of Gorinchem in the western Netherlands employees of the Medical Export Group (MEG), a commercial firm, pack the medications, spinal needles, surgical equipment, and other items into labelled boxes. Like Babanin from WHO, the MEG packers are not aware of the final destination for the aid. The company specializes in providing medical packs internationally for humanitarian organizations. The IEH Kits are loaded onto a ship at the port of Rotterdam, 40km away, and shipped to Dubai in the United Arab Emirates. By January the latest emergency shipment is in Dubai, home to the Middle East UN Humanitarian Response Depot (UNHRD) run by the World Food Programme (WFP), which as well as delivering food aid, provides logistical support to much of the UN. Nevien Attalla is the pharmacist with UNHRD in Dubai, and helped the WHO medical aid along the next part of the journey. “The request comes in through the UNHRD customer service mailbox. To support any emergency response we manage assets so they are readily available for deployment within a 24/48 hour time frame,” Attalla told IRIN. For this outbound shipment, she has to seek approvals from the UAE’s Ministry of Foreign Affairs, the Ministry of Health and the Narcotic & Precursor Chemical Unit in the capital Abu Dhabi. She also arranges WFP supporting letters for each border crossing. As soon as the shipment is cleared the aid items are packed up for transportation by truck to Syria. 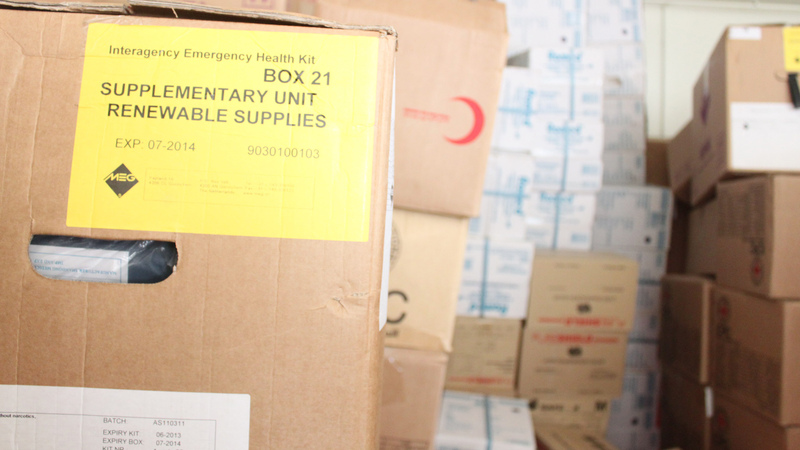 The medical aid is stocked at UNHRD’s 22,500 square metre covered storage space in a desert area far from Dubai’s skyscrapers. The warehouses, part of Dubai’s International Humanitarian City are close to Jebel Ali port, the world’s largest man-made harbour, and also Dubai World Central-Al Maktoum airport. The heat in this place is often unbearable. However, inside the warehouses it is mostly fresh and cool. “We have 5,000 square metres which are temperature-controlled between 18 and 25 degrees Celsius. There is also a cold room to guarantee the storage for cold chain pharmaceutical goods,” Doris Mauron Klopfenstein, who works in logistics for UNHRD, told IRIN. The hardest and final section of the journey begins on half a dozen trucks - driven by Syrian truck drivers, a requirement set by the Syrian government. The two-year conflict in Syria has caused widespread disruption of the health care system; the 54 tons (52 kits) provide enough lifesaving medicines and supplies to cover emergency health needs for three months for an estimated population of half a million, potentially a tempting target for armed groups. Since the beginning of the conflict WFP has reported more than 20 attacks on warehouses, trucks and cars in Syria. The truck drivers hired by a WFP subcontractor set off from Dubai and take a route through Saudi Arabia, Jordan and then into Syria. “The convoy remained several days at the Jordanian-Syrian border because of heavy fighting between Damascus and Dera’a Governorate,” said Elizabeth Hoff, head of the WHO office in Damascus. Heading to the capital they cross through ever-changing government and rebel zones, and are frequently held up at checkpoints. But regular closures at the airport in Damascus and the length of the sea route mean trucks are the best option. On 27 March the trucks finally arrive at the WFP warehouse in Alkisweh, rural Damascus. WHO and SARC carry out an assessment of the supplies, and then the aid is dispatched to Aleppo, 360km to the north. WHO distributes 70 percent of such supplies through the Syrian Ministry of Health and the Ministry of Higher Education, and 30 percent through NGOs. “Needs in Aleppo are increasing constantly. The health system is reeling due to the lack of medicine and medical instruments, especially for chronic diseases, and poor accessibility [geographical, social, economic and security], raising more challenges to the Syrian dilemma,” said Kady. About six million people live in Aleppo Governorate, but since the conflict started an additional 1.5 million internally displaced persons have sought refuge in the city. “This journey [Damascus-Aleppo] usually takes about four hours. Nowadays this road is very important for all parties of the war. The shipment passed almost 60 checkpoints and it took 11 hours,” said Kady. On 13 April the goods are then distributed to their final destinations - two main hospitals in Aleppo and 10 health centres. But the possibility of further deliveries from Dubai is slight at the moment given the growing insecurity. While UN officials continuously urge all parties to respect humanitarian principles and ensure safe access for relief supplies, “for the moment no further shipment of medications is planned from Dubai due to the continuing bad security situation in the entire southern part of Syria,” said Hoff.